I mean, yeah, nobody likes Joey Gallo for his defense. The Rangers outfielder is a man whose dingers are to be admired and whose mediocrity in the outfield is to be ignored if you want to fully enjoy him as a player. But somebody’s gotta play out in left for Texas, even if he represents a grave danger to his own pitcher. 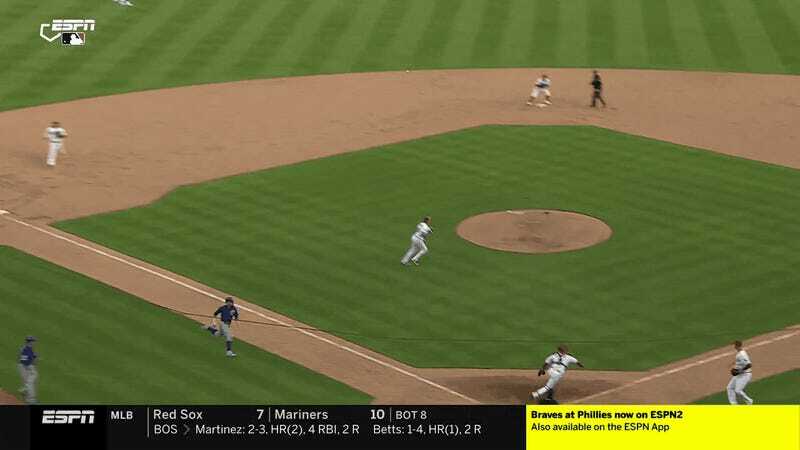 While trying to force a play at the plate in a game against the Cubs today, Gallo instead forced Chris Martin into a duck and cover drill, as the throw from left came zooming towards the reliever’s head at way too fast a speed to be safe. Thankfully, the ball sailed over the alert pitcher, but it was too damn close for someone standing that far away from the action. It was a 10-9 game, dude. Those runs were coming free and easy, and trying to stop one of them isn’t worth a man’s life. Update (7:56 p.m.): Gallo scored the game’s winning run on a wild pitch. Uhh ... what goes around comes around?